The building of Houghton Hall. In April 2011 I came up with a design for a new building based on a real life English country house. This was Houghton Hall, you can see photos of the original house by following this link to the Houghton Hall page. This took quite a while to build as it was the first time I had ever built some thing as large as this and basically it was a lot of trial and error as I came up with the design. So I wrote a series of blog entries as I built it to show everyone what was involved then created the more detailed blog post below, which I had on my blog at the time of building it. Over the years I have had many requests regarding the hall asking for how to instructions, the parts involved and how much I would charge for one. These requests often surprise me as I find it easy to see what parts are need, those are from Victorian Mansions, Steck Castles, Fairy Palaces and a Roman Colosseum. Honestly I don't have time to write detailed instructions on how to build any of my houses, but I never thought it necessary as all my houses are built by joining one wall to the next, as you would a normal house but just keep going adding more rooms or floors as you like, it's not very complicated, let your imagination run wild until you run out of parts. As to costs now that it is so hard to find all the parts involved in this building if your going to try and do it your self be aware that your looking close to £2000 (I know the current costs involved as I've just finished my 5th and last one) and 2 to 6 months to build depending on how much time you can spend on it each week, it took me around 560hrs to build the last one!!!! So for everyone who ever wanted to know how I build a house or why my houses cost what they do I hope you will read some of the following to get an understanding of the time and effort that goes into one of my creations no matter the size and why I can no longer create Victorian Mansions due to the costs involved. This is Houghton Hall an English stately home and the basis of my newest Playmobil Mansion. My first task was to work out the size of the mansion and it's shape made from available parts. This involved cutting various walls and floors to size, to create a wide building with the side wings jutting forward out from the front of the building. The original building has a different type of brickwork for the ground floor so I have tried to give the same impression by using castle parts for this floor. Then once I had a good day weather wise I painted the entire building in several coats of paint to give it a pale stone looking affect. I then tried my hand at the large front sweeping staircase, although not exactly the same the larger central arch gives easy access to the servants door on the ground floor. As the main walls were now finished I added on white windows and frames with a painted black front door. Now that the main walls have been cut and painted it's time to dismantle the hall and start work on the inside floor by floor, starting with the servants rooms on the ground floor. To keep with the idea of a typical stately home and their below stairs servants quarters, the large castle brickwork has been decorated to look like whitewashed walls. 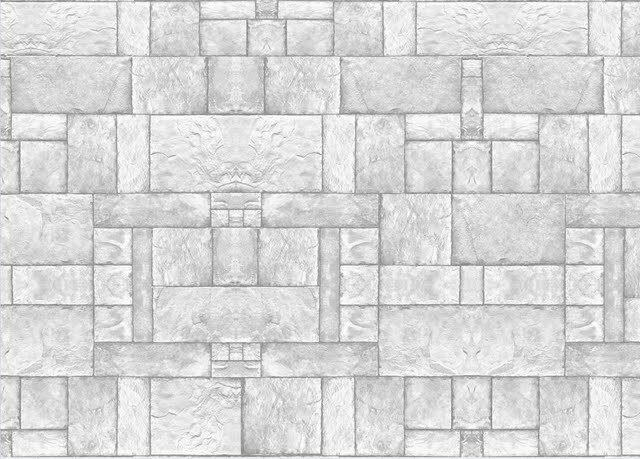 I then designed pale flagstone flooring to be used throughout the ground floor. Playmobil lights are nice, battery powered and easy to fit but they are very modern looking and have very short wires and so I'd need at least two units per floor - about 3 main sets plus extras. The dolls house lights are the prettiest but also the most expensive ranging from £3 - £20 per light plus it would mean having one long connecting wire running all the way through the house. Doable but it would add several hundred pounds to the costs! The last choice and the one I went for is to use small LED's running from a battery pack. I got hold of a bright white set long enough to light up a full floor. These I've attached to the roofs and hidden the wiring behind a false ceiling with just the lights showing. This makes a discrete but bright light throughout. This is one of the large side rooms with the painted walls, flooring and lights. To put the lights in I had to adapt the flooring to fit the new shape rooms and had to cut a channel through each one and the walls to allow the wiring through. I also had to move the stairs from the left side of the main hallway to the right side and further back so it wouldn't interfere with the main staircase on the first floor. As you will know this ground floor being shorter than a standard mansion floor would need an adapted staircase leading up to the first floor. I didn't want to put in a standard set of stairs as I need the space, so I've put in a spiral staircase. If possible I'll add a stair rail to these steps if it will work I'll add pictures later. I don't always work in order I often get sidetracked by a new idea or just fancy a change to I go off and do something else. This has happen a lot with this ground floor. Originally this had five rooms but after a bit of messing around and trying furniture sets in here (more about those later) I've ended up altering the floor plan so there are only four rooms. I know this sounds like a simple change but it involved cutting new parts and painting them, then dismantling the building to arrange things. This I did three times as I came up with more changes to the kitchen as I went along. I've been working on the furniture for this mansion as I go along hence the slow progress on the actual building. The first set finished was a laundry simply as I had made that last Christmas but never got around to using it but it needed the bigger room. I then started work on the kitchen as this was going to be one of the more complicated rooms to furnish as I had several ideas I wanted to try out. The first was the built in large kitchen range (oven) suitable for such a big house. Again I built the range then having looked at some photos of Victorian kitchens thought it would look better as a built in unit - more chopping and changing of walls! This is what an original set of Victorian kitchen furniture would look like in the kitchen. I've customised this set adding extra pieces and painting the whole set brown with further embellishments. As you can see it can make quite a difference to the room. So let me give you the tour round. The oven with sink and plate rack above. The double oven / range. Having sorted out the room and fitted the oven in place I realised that it looked a little dark so I have moved all the lights around in the kitchen putting two inside the large arch to light up the oven. There's a large table down the centre with two kitchen cupboards at the back. Next door to the kitchen is the wine cellar filled with loads of bottles and kegs. And now my version, each servant has a bedside table, shelf and chest to hold personal belongings. There's two wash stands and a tin bath in the corner. So now the ground floor is finished I've started on the second / middle floor. I had an idea I wanted to try out in the hallway / entrance hall that needed quite a lot of work to do. I'm glad to say it looks fabulous but I want to leave the hallway to last as I want you all to see it with the hall roof on so you can see both levels together. I'm currently working on the roof so I may have pictures soon. My next job was to sort out the lights, same process as before - string the LEDs to the ceiling and conceal the wiring. The first room I worked on was the dining room this was because I had to build the top part of the dumb waiter at the same time as I worked on the bottom section in the kitchen. I cut out part of the floor to allow the self up to the top part of the dumb waiter which I housed inside a wardrobe. I had to cut out all the insides and fix the drawer shut, then attached the pulley system to it after threading it up through the floor. (I'll add dining room pictures here soon just got a few things to finish) Now that all the cutting of floors and walls was sorted out I could make a start on the decorations. I usually paint and decorate a furniture set first then from that pick colours to use on a matching wallpaper scheme. I had a set of very nice cream cushions with gold flowers on them, these I used as the starting point for the living room set. I used cream material to cover the couches and chairs after painting the entire set of furniture a nice dark brown. I added gold accents to the furniture and decorated a fireplace in cream and marble. I wanted to try and match the wallpaper to the cushions so I ended up with a white and gold flowered patterned wallpaper above white base panels then finished the room off with cream carpet cut to fit. Next door to the living room is the study with card table. Here I painted the furniture a deep maroon with gold highlights. Next to this is the hallway but that will be on here a lot later yet. After the hall is the music room. I sort of cheated again with this room as I had a set of furniture and instruments already painted that I did at the start of the year so this room was pretty quick to decorate. The last room on this floor is the dining room. The tall unit on the left is the dumb waiter with two matching sideboards. I've decorated the main table and sideboard with china dishes and gold cutlery. The second floor is now finished just a few finishing touches to add here and there but pretty much all done. I wanted a break from the room sets so I've made a start on the hall's flat roof. I've built the domes for the top and have cut down all the edging to go around the perimeter. Well instead of working on the roof I had to go back to the dining room as after studying the pictures above I decided it didn't work right. I wanted to get rid of the tall cabinets at the back as they blocked off the windows and my sideboards were just a bit too tall. I've altered the sideboard which involved cutting them down and redoing the tops and then I created two more units for the back wall from converted kids cupboards. The whole effect has created a more open and brighter looking room. As I'd started on the dining room again I just carried on and set to on the top floor. The first room on the left is the master bedroom. Set in one of the two largest rooms and had plenty of space to work with so instead of the usual twin beds I've used a large four poster and decorated it to match. I've also included an extra wardrobe, comfy chair and chest as well as lots of other little extras here and there. The furniture has all been painted maroon with gold highlights to match the bedspread. Next door to this is the bathroom, customised in pale green and bronze. Since last updating this page I had a whole change of heart about the second floor. First off I wanted to change the dining room curtains as the red ones blended in too much, so I've taken them out and repainted them. Then I decided to change the wallpapers in three of the rooms to make them all look grander in style befitting a large stately home rather than the more patterned Victorian style wallpapers I originally chose. This took a full day to design them, remove the top floor - which I'd already decorated - strip the walls and add the new papers, build the house back up then make a start on the last set of lights. Here's the new look rooms with before and after shots..
As I had redone the rest of the rooms I had yet another go at the dining room. I wasn't too happy with the dumb waiter. Although I had made sideboards to match it it still looked like a wardrobe so I've boxed it in to make it look how a real one would, built into the wall. If only I done this in the first place I would have saved myself a lot of time and effort converting the wardrobe. Oh well I'll know for next time if I ever do it again. In the middle of doing all this I had a crises over the lights. Even though I had bought the same brand as before the new set of lights were more yellow in colour which affected all the wallpapers on the top floor. My only option was to dismantle the house down to the servant's quarters take out the old set of light and put in the new ones. They yellowish lights wouldn't make a difference in the ground floor but I did need to use the old set for the top floor. The down side to all this was I had just glued down all the flooring after changing the wallpapers, so it made it a lot more difficult to dismantle the house. All in all about half a days work just to alter the lights! I now have lovely bright lights on the top floor! Fitting the lights on the top floor turned out to just as awkward as doing those on the ground floor due to problems in lighting up the hallway. The hallway has been a major bit of work and taken the longest to finish. Not as complicated as fitting the dumb waiter but I think it will turn out to be the best room of the whole house and yes I will share pictures very soon. The last two rooms on the top floor are now done and dusted and these are the children's bedroom and schoolroom. As the end room is very large I could have fitted all the children's stuff in there but I wanted to create a separate schoolroom as all great houses had one, where all the children could be kept out of the way. "Children are to be seen but not heard!" an old but popular saying here. A while back I mentioned the hall being a bit different than normal and not wanting to share it until it was totally finished well the time has come to reveal all. The trouble with the standard playmobil mansion being quite small, the front door always opens into a kitchen or living room. There isn't the space to have a separate hallway, wherever possible I try to add one to my houses to make them seam a little bit more realistic. If you've had the chance to visit a large mansion you'll see they have very large imposing staircases, usual open plan sweeping up to the next floor. I wanted to try and recreate this sense of grandeur. There are two main types of staircase those that lie against the wall spiralling upward or the regal central staircase. I chose the second mainly as I didn't have the room to create a proper spiral as I was only going up one floor. Also I wanted to create a balcony around the hallway. My first job was to cut out the middle floor to from the walkway, I did this even before completing the laundry as I wanted to know if my idea of a central staircase would work. Once I tried it I then needed to move the stairs from the laundry from their usual place to the back corner so I would have enough room to place the staircase above. I then modified the stairs adding a rail to both sides. I wanted the upstairs balcony to have a matching railing around the edge so using lots of straight stair rails I formed the balustrade. These grand hallways tended to have lots of plasterwork in them so I've added extra door frames and windows to give this impression. I also wanted to keep the original idea of a removable staircase so I had to form a small hook on the edge of the balcony to attach the staircase to. The banisters you can see in the bottom picture are those around the top of the spiral servant's stairs. My other main idea was to give a bright naturally lit area to the house, I wanted the hallway to be a real central focal point something really different. So I've opened up the roof. I know this is change from the original Houghton hall that doesn't have a central dome but I thought it was vital to whole design of the hall. To this end I cut a circle into the upper roof and added a skylight in the form of an open lattice dome. I should point out that creating all this was not as easy as it might seam reading all this. It took three days work to cut out the floors and create the stairs, a day spent on the banisters, and another on cutting out the dome. Never mind the hall decorations - walls, flooring, ceiling, lighting etc. This one small area has taken the longest of any part of the house to do. I had to cut down each of the doors and windows filling them down to fit. I spent several hours just trying to find the right design for the upper roof, to no avail, ending up creating a very basic pattern that lucky looks good. Phew! But all in all I would say it is my favourite room for all it's simplicity. I painted the interior of the dome white to match the rest of the hallway and the struts bronze. I fixed a small hook to the top to support the chandelier which I enhanced with some very nice sparkly stickers. I was very lucky that the chain was just the right length to hang down without having to alter it. Having thought I'd finished the interior I had a change of heart again after taking to fellow Playmofriends and I have changed my study / games room again. I've now converted it to a library. Keeping the same style of wallpaper I have just created a bookcase version instead. I have to admit it was a bit awkward fitting the new paper without dismantling the house again - something I just didn't want to do. I built a short but long bookcase and added a lectern as well. My last two jobs were to finish the roof and and the rest of the outside. 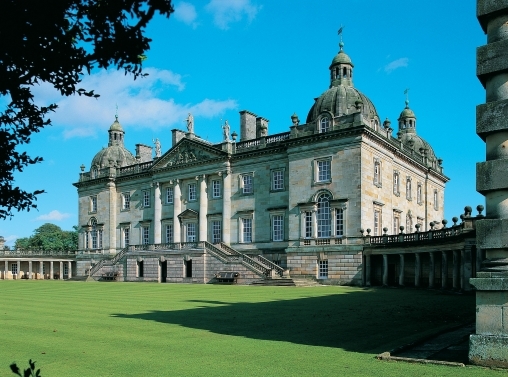 As you can see from the original photo Houghton Hall has a flat roof with a balustrade, domes, statues and a portico. Soon as I saw this hall I new the roof could be done with Playmobil domes and the stair rails with a few more things added. So I've always had the idea of how to build it. As the roof is flat I just needed to alter the appearance of the normal brown flooring used in the mansion. The underside has the false ceiling with lights fitted to it and the top I painted in several layers to give a darker grey stone effect. I used several of the patio "U" railing edges cut down to fit around the entire edge. I wanted to make the balustrade the same as the one on the main stairs and the staircase inside using the 5300 stair rails. It took about eight rails to create the balustrade around the hallway. This gives you an idea of how many I'd need for the roof. I think I measured the length at about 10 foot long. This worked out at 34 rails! Which I didn't have. So I called up the excellent people at Playmobil and asked if I could buy some - sure they said but the most you can order is 3 sets ( straight & slanted) of rails. Not much good to me. I hunted around on the internet but there was no chance of getting hold of so many unless I wanted to wait months buying odd ones here and there. I'm not that patient a person. The next option was to try for doll's house parts, after much searching I managed to buy 10 sets of wooden railings. These don't look too bad but being 1:12th scale they are just too tall to use. I had to cut down each rail by hand to make them shorter, removing the base and part of each post. This is a close up of the original hall roof. The balustrade is broken up at regular intervals by plinths with urns around the whole length and at the front three statues above the portico. This made creating my roof easier as I just had to cut my railings down to fit between my plinths - no awkward joins! I put small urns on each corner and along the back, fitted in the railings, built two more domes with spires and painted the whole lot the same stone effect as the rest of the hall. I originally created three stone statues so as to follow the original Hall design, but when I tried them out it didn't look right because of the central dome, so I've just used two. I also decorated the chimney pots to match as well. Now that the railings were pretty much done I could start work on the portico and the main stairway. I'd noticed that the main stairs didn't quite blend in as I needed with the house. Referring to the original Hall photos I wanted to just extend them outwards a little adding another couple of steps. The fun part was creating the portico above, I managed to extend a section of roofing outwards so it covered the central three windows. To this I added the column plinths top and bottom, then cut down a long plastic pipe to create the columns. This is the only other major part except for the roof railings that was not made from Playmobil. This was simply because they don't do any sort of tube long enough that I could adapt. If you look on the photo of the original house you can see it has a plaster relief on the front of the portico. I wasn't sure how to do this myself so I plumbed for the easier option of just printing one out. I couldn't believe it when I used a copy of the real thing to find it fit perfectly. The roof angles of my hall and the original match - what are the odds of that! So that is it, finished at last, my biggest ever project and one I wouldn't build again. I hope you have found this behind the scenes explanation interesting and have a small taste of how much work can go into a project. It's not always plain sailing!